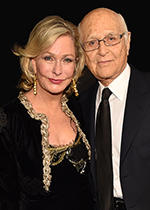 Lyn and Norman Lear founded the Lear Family Foundation to support a wide range of projects that addressed issues such as civil liberties, the environment, health, youth, civic activism and more. Supporting and encouraging documentary film has been a natural fit for the Lears as documentarians take on issues of mutual importance to affect change. This year, they will receive the IDA’s Amicus Award in recognition of this work. Lyn Davis Lear is a social and political activist and philanthropist whose main passions are the arts and the environment, with a specific focus on climate change. Ms. Lear is the President of Lyn Lear Productions which aims to inspire, educate and activate people on global environmental issues through television, film and all forms of media. Over the years, Ms. Lear has been involved with numerous documentaries, including the short film “What’s Possible” that opened the UN Climate Summit for world leaders in September, 2014, and as Executive Producer for “Cesar’s Last Fast” and the upcoming “Fabulous Funghi." She is a board member of LACMA and Sundance Institute, where she has supported the Sundance Institute Episodic Story Lab and Sundance New Frontier Lab, among other creative initiatives. Ms. Lear with Cindy Horn with their husbands Alan and Norman, created the Environmental Media Association now about to celebrate it’s 30th Anniversary. Norman Lear has enjoyed a long career in television and film, and as a political and social activist and philanthropist. Beginning his television writing career in 1950, Mr. Lear challenged social paradigms from the outset with notable TV series such as “All in the Family,” “Mary Hartman,” and “The Jeffersons.” In 1980, Mr. Lear formed People for the American Way, a nonprofit organization designed to speak out for Bill of Right guarantees and monitors violations of constitutional freedoms. Mr. Lear continues merging his work as a social activist and in television with his most current documentary venture, America Divided, now airing on EPIX. The American Masters documentary Norman Lear: Just Another Version of You is coming soon to PBS and Netflix.